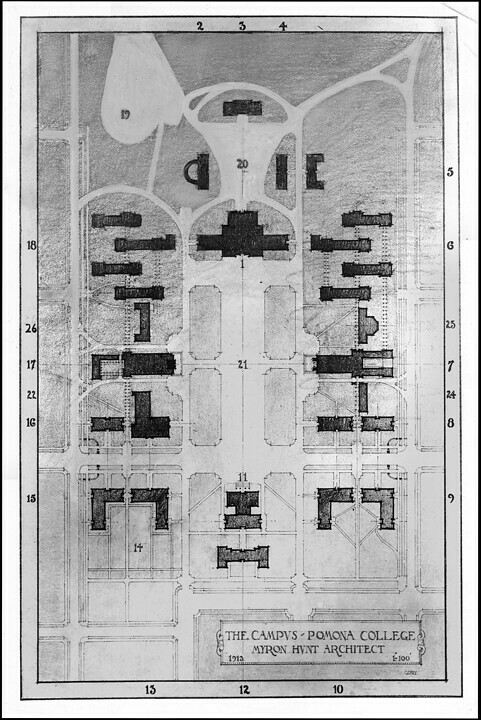 In 1908 the trustees commissioned architect Myron Hunt (1862–1952) to design a campus plan for Pomona College. Born in Massachusetts and trained at MIT, Hunt first practiced in Chicago where he was associated with Boston-based architect H. H. Richardson, exposed to the work of Frank Lloyd Wright, and, like so many of his peers, profoundly influenced by the World’s Columbian Exposition. Moving west in 1903, he established a practice in Pasadena that included private and institutional clients; his career ultimately included campus commissions from Caltech (then Throop Polytechnic) and Occidental College as well as Pomona. 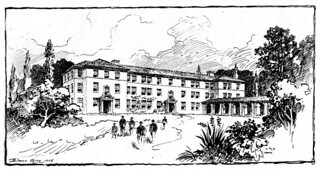 Hunt’s arrival in Claremont marked the beginning of a period that would see the creation of some of the College’s finest buildings, including Bridges Hall of Music, and the development not only of an embracing vision for the campus but also of an architectural style that would distinguish and guide the College for years to come. 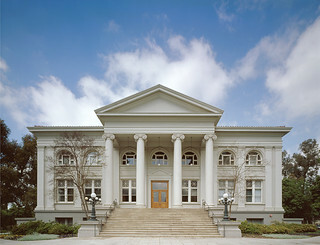 At the dedication of the Carnegie Library in 1908, President Gates declared: “There is not a college or university in the land that would not be ornamented by it,” and, for many, Carnegie remains one of Pomona’s “signature” buildings, anchoring the campus on College Avenue facing Marston Quadrangle. A favorite of photographers and filmmakers, it has served as the backdrop for annual faculty photographs, countless wedding and family portraits, and several Hollywood movies. The College’s first library had been housed in a single room in Pearsons Hall, but by 1906, its 8,000 volumes had taken over the entire south half of the first floor. The need for a separate library building was clearly a priority, and philanthropist Andrew Carnegie, who was, at that time, engaged in a massive program to develop libraries (which would number more than 2,500 by 1918), was the logical source. Carnegie’s pattern was to fund buildings but to require the recipient institution or community to provide site and maintenance. In April 1905, the foundation responded to the College’s solicitation with a gift of $40,000, which the College agreed to match in new endowment. This was accomplished by 1906; the building was under way by January 1907, and completed the following year. Carnegie initially served the City of Claremont as well, a situation that lasted until 1914, when a drive was initiated to found a community library. Claremont’s public library, on the corner of Harvard and Second Street, occupies land sold to the City by the College. The need to house the second-hand six-inch telescope that Professor Frank Brackett used in teaching astronomy and enable astronomical observation on campus ultimately led to the construction of an observatory in 1908. Building funds were provided by Llewellyn Bixby, Class of 1901, a student of Brackett, and other friends supported the purchase of equipment. 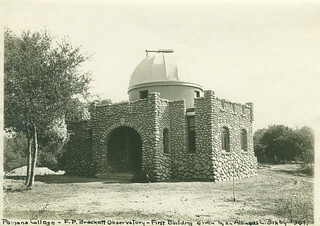 The observatory was dedicated in 1908. 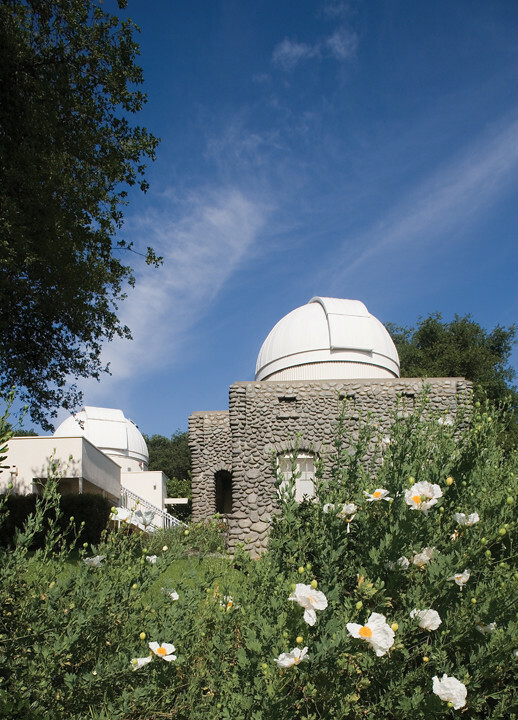 Designed by Brackett, the observatory was constructed of local field stone and concrete, and surmounted by a manually controlled, revolving dome. Although increasingly sophisticated equipment was acquired periodically over the years, the building remained essentially unchanged until the 1970s. Built in 100 days during the summer of 1908, Smiley Hall was the first campus building designed to be a dormitory. Before it appeared (and with the exception of the College’s first two years), most male students lived in private homes in Claremont, as was typical of the time; women students were then housed in Sumner Hall. 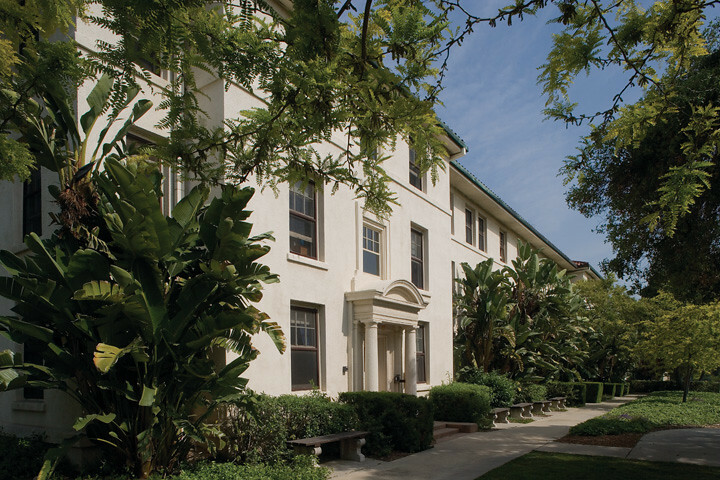 Although the City of Claremont had grown from a population of 250 in 1900 to 1,114 in 1910, and had room to accommodate students, attitudes about dormitories were shifting. Many (including donor D.K. Pearsons) believed that living closely together could enhance students’ educational experience (and not, as was formerly feared, lead to mayhem). It was Pearsons who suggested the building be named for Albert K. Smiley, a botanist, horticulturalist and longtime trustee (1893–95, 1899–1908). Smiley Hall also was the first of three campus buildings by architect Myron Hunt. 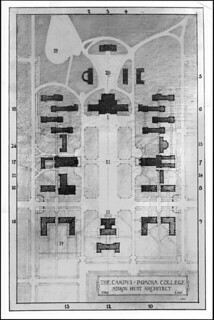 It was sited east of Holmes Hall as prescribed in the campus plan he had presented to the trustees that same year, and its style—a simple, geometrically disciplined block with light-colored walls and a low, hipped, red-tile roof—offered, in Robert A.M. Stern’s words, “a vernacular classicism...that deftly modified a Mediterranean-inspired architectural style for the Southern California landscape.” Had a projected arcade (recorded in a 1908 drawing by Hunt’s partner Elmer Grey) been built, Smiley would have resembled even more closely the architect’s other campus buildings. Today, Smiley is said to be the oldest American college dormitory in continuous use west of the Mississippi. The 1909 Metate (published by the junior class in 1908) featured a prominent photo of “Old Baldy,” as the students liked to call Mount San Antonio. 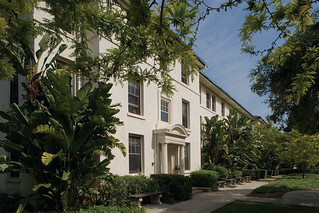 The reference to the mountain as “one of the priceless assets of our college” indicates that students felt that their proximity to undeveloped wilderness areas for outdoor recreation, as well as the physical beauty and presence of the mountain in the landscape, was a major asset of Pomona College and a big “plus” of its location in Claremont. The Southern California Conference was formed in 1908. For the first time, by agreement among the institutions in the conference, students in the Preparatory Department were not permitted to play on what would be, from that time forward, exclusively college athletic teams. The new conference would only last three years, however, before collapsing in 1911, when the University of Southern California, angered by the decision to declare its law school students ineligible, withdrew from membership. The College also turned athletics over to the management of the faculty, took over maintenance of athletic facilities, and began to include the $5 athletic fee with the tuition fee instead of collecting it separately for the Athletic Association. William Himrod ’08 set a Southern California record in the mile for the Track and Field team with a time of 4:26.8, which wasn’t broken until 1930 and remained the Pomona College record until 1938. Japanese immigration to the United States was forbidden. The Tunguska event, also known as the Russian explosion, occurred near the Podkamennaya Tunguska River in Krasnoyarsk Krai, Siberia, Russian Empire.